International cooperation projects help IKV to further develop its course content. We would like here to present a brief outline of some of the particularly interesting projects from the many fields of plastics processing. The aim of the research project "Connecting simulation and machine to optimise the production process of injection-moulded parts – CoSiMa" (03INT507BA) is to achieve continuous communication between process simulation and the injection moulding machine. 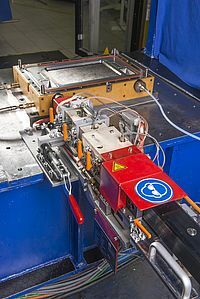 With an international consortium of German and Slovenian companies together with the Slovenian research cluster Tecos – Slovenian Tool and Die Development Centre, Celje, Slovenia – a transfer function is being developed to transfer simulation-based set-up datasets directly to the injection moulding machine. With the help of a Manufacturing Execution System (MES) as the mediator between simulation and machine, it will also be possible to support the machine operator in the setting-up process by providing the simulation results from a relevant process window. Apart from its own activities, IKV is also coordinating the successful international cooperation within the consortium. ARBURG is driving the machine-related development of the necessary interfaces and the machine control system, while GRP provides the infrastructure for data handling. Simcon is looking after the simulation-related interface and the stored material models. TECOS coordinates the work of the Slovenian partners and the processing of the mould-related parameters, while practical tests are carried out by the two partners, KOLEKTOR and TEHNOMAT. The EU cooperation project "Cross-linkable CO2 polyether polyols" (CroCO2PETs) examines areas of application for crosslinkable polyether polycarbonate polyols with integrated carbon dioxide for elastomer production. By using carbon dioxide, around 25 percent of the otherwise used oil can be replaced with CO2 to help conserve the finite natural resources. These polymers can be processed by various methods of rubber and polyurethane processing that are being consistently further developed and adapted. Apart from the technical development of the polymers, the project also examines the ecological and economical development of the new polymers. With the aim of enabling the quality-assured, controllable inline production of aircraft parts by the RTM process, a new type of injection unit was developed jointly with the firms Airbus Operations GmbH, Stade, and Fill Gesellschaft m.b.H., Gurten, Austria. Based on disposable cartridges, the new injection unit allows the production of RTM parts under controlled conditions. The injection unit is equipped with a sensor box which incorporates a dielectric sensor in addition to the temperature and pressure sensors. This makes it possible among other things to measure inline the degree of crosslinkage of the resin and the viscosity. While the crosslinkage level is of relevance for quality-assured production, the viscosity measurement offers the potential of an integrated control of the injection process. The production of CRP visible parts with high fibre volume contents generally necessitates time-consuming post-treatment and surface coating. For the efficient production of visible CRP parts with high fibre volume contents, IKV, together with Mubea Carbo Tech GmbH, Salzburg, Austria, is developing a method for the process-integrated application of a high-quality surface layer. For this purpose, a PU spray process is combined with a classic liquid resin press moulding process. The surface coating, applied integrated into the process, can either be of the same material as the matrix or an aliphatic PU system. The latter is transparent, UV-stable and self-healing, and can thus be used for interior applications even without an additional finish. A sandwich structure offers considerable potential with regard to high stiffness and low weight. The production of structural 3D sandwich parts with continuous fibre-reinforced outer layers has until now not been efficient enough, because several process steps are needed to mould the foam and impregnate the outer layers. The aim of the PU-LIT project is therefore to further develop the PU spray process chain for the large series production of complex FRP sandwich components. The production of the 3D foam core is to be integrated into the forming and crosslinking process of the top layers. The project partner here is Greiner Perfoam GmbH from Linz in Austria. Water repellency and attractive tactile properties are important properties for plastics surfaces in many areas of application such as the packaging and automotive industry, but also in medical technology, and can constitute enormous added value. On the other hand, structured mould surfaces can influence the flow behaviour of the plastic melt in the cavity by reducing friction between the mould and the melt. This results in a lower injection pressure and improved demoulding. As a result, reduced wear and tear on the machine and mould can be achieved. In the injection moulding process, these surfaces can be produced by forming microstructures on the component. In order to ensure the necessary design and production of micro and nanostructures for the given fields of application, a holistic study of the functionality and production of the structures, coating of the cavity, process control and modelling and simulation are required. The SEPIM project is devoted to researching these factors.